I love recipes where I can just throw ingredients into a bowl and shove it in the oven allowing the flavors to fuse. This is a great simple dish that presents very well. You can cook it in advance and reheat before serving. It is designed for sharing. We had this dish as a late lunch after having round around London all day looking for a suitable house to move to. I served this with some rocket salad, hummus and pita bread. In a bowl mix together the spices and lamb. Shape into small flattish balls. 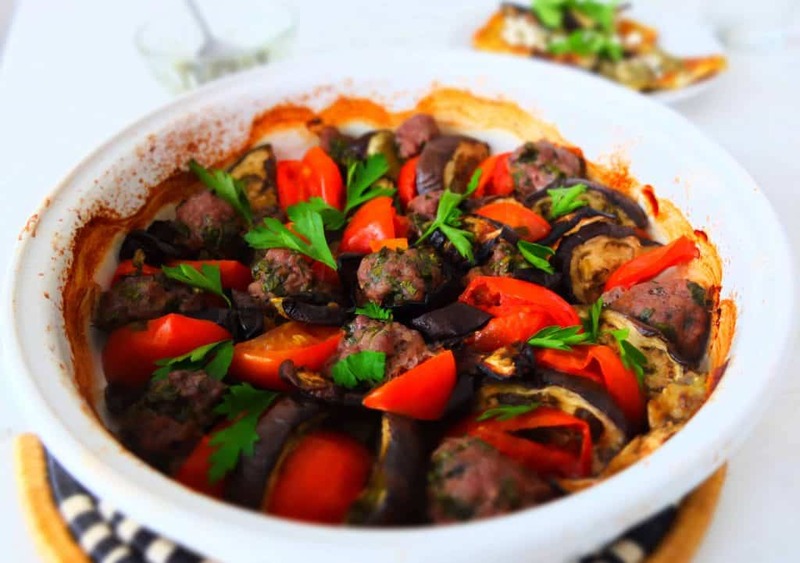 In a large oven dish place a tomato slice, then an aubergine slice followed by a meatball. Repeat arranging them in a spiral. Place in the oven at about 180 degrees Celsius for 40 minutes. Sprinkle with some fresh parsley before serving. 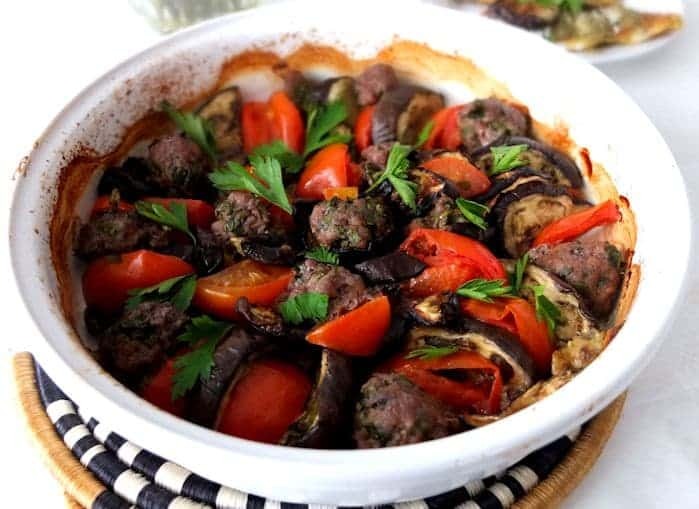 7 Responses to "Baked Lebanese Meatballs with Aubergines and Tomatoes"
This is looking fab! We love lamb, so I’ll definitely give this a try soon. Thanks, yes lamb is one of my favorites as well! Is 250 grams + to 1/2 lb? That seems like a very little amt of meat for all that eggplant and tomatoes. Also, is 180 degrees in this recipe celsius? =350 farhenheit? Hi Ginny, thanks for stopping by. I used for this recipe 250 grams minced lamb, which I agree is not a lot of lamb, but I wanted to write down exactly how I cooked this recipe. If you want more I would up the quantity to 450 gr lamb. It’s also 180 degrees Celsius. Sorry, being in the UK I sometimes forget that not every one uses Celsius. Thanks for pointing that out and I will update the recipe now. 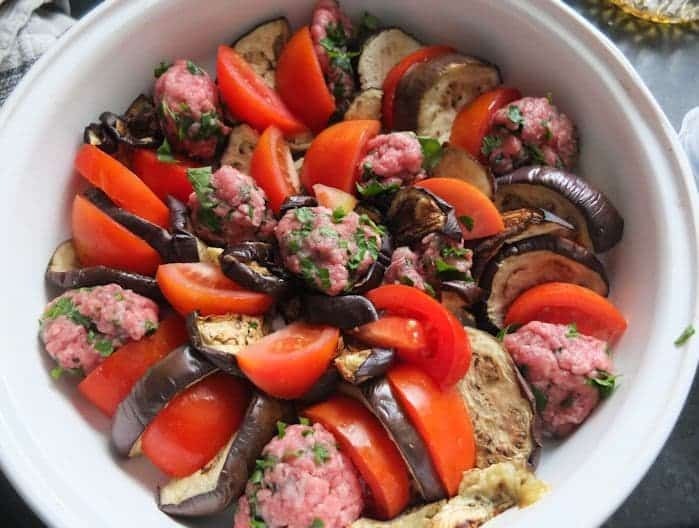 Marita, I am glad that you are interested too in Lebanese food!Your dish sounds delicious., and hummus is the perfect accompaniment to kafta(meat balls)! Have a pleasant day! Thank you Hadia. I have been following your blog for a while now and love your recipes. The are very inspiring.